Based on the novel by Robert C. O’Brien, Z for Zachariah is the story of a nuclear holocaust survivor who finds another survivor as she takes him in where their quaint life is disrupted by the arrival of another survivor. Directed by Craig Zobel and screenplay by Nissar Modi, the film is a look into people dealing with their own emotions as they all try to survive the aftermath of a nuclear holocaust and restart their lives. Starring Margot Robbie, Chiwetel Ejiofor, and Chris Pine. Z for Zachariah is a riveting and somber film from Craig Zobel. The film revolves around the aftermath of a nuclear holocaust as a young woman who had survived the event as she would meet an engineer who would help her get electricity in her home as they form a friendship that is later disrupted by another survivor who had lurking around. It’s a film that explore three people dealing with loneliness as well as being the possible survivors of a nuclear holocaust where there is very little land where they can be safe as there’s areas around this young woman’s family farm where it is contaminated with nuclear radiation. Nissar Modi’s screenplay doesn’t have much of a plot as it’s more about the need to survive and start all over as the protagonist Ann Burden (Margot Robbie) spends much of her time planting seeds and creating crops as well as pick up whatever she needs wearing a gas mask and such to contaminated areas. When she encounters John Loomis (Chiwetel Ejiofor) in a radiation suit as he arrives to the non-contaminated area until he swims onto a contaminated pond with a waterfall is where Ann helps him get better despite his leg injury. Much of the first act is about Ann and her time with John as the latter sees the waterfall as a way to create a water wheel for a power generator that Ann has but in need of repairs. The second act prompts the arrival of Caleb (Chris Pine) who would lurk around until Ann’s dog had sniffed him as he would be taken in despite John’s reluctance. It would set the tone for what is happening during the course of the film as John is suspicious of Caleb but does realize that Caleb is still a helpful man who had endured his own experience with the nuclear holocaust. Craig Zobel’s direction is quite straightforward in terms of the setting and compositions though there are some stylistic shots that do pay homage to the films of Andrei Tarkovsky. Shot mainly on location in New Zealand with some of the small town locations shot in West Virginia, Zobel’s direction does have some wide shots to establish the location as well as the sense of isolation the three characters are in as if they are the only survivors left. Much of the direction would be simple in the way Zobel would frame the characters as well as build small moments of suspense including the scenes in the second half where there is tension between John and Caleb but it is very restrained. Zobel would hint into some of the sexual tension that is looming within the three but have the characters remind themselves that there is so much more at stake as it relates to survival as well as what to do to stay alive. Even in the usage of close-ups and medium shots to play into the drama where the third act is about building this water wheel for the power generator as well as what Ann wants in her life. Overall, Zobel crafts a gripping yet evocative film about a trio of people trying to live their lives following a nuclear holocaust. Cinematographer Tim Orr does brilliant work with the film’s cinematography with its usage of natural lights for many of the exterior scenes as well as candle lights for some of the interior scenes at night. Editor Jane Rizzo does excellent work with the editing as it is straightforward for much of the film with some rhythmic cuts for the suspenseful moments. Production designer Matthew Munn, with set decorator Amber Richards and art director Ken Turner, does fantastic work with the look of the home that Ann lives as well as a gas station nearby with thing she hasn’t taken and a church that her father used to run. Costume designer Bob Buck does nice work with the costumes as it’s mostly casual with the exception of the radiation suit that John wears early in the film that Caleb would wear later on in creating the water wheel. Visual effects supervisor John Bair does terrific work with the some of the film’s minimal visual effects as it’s mostly set-dressing for some of the exteriors such as the trees and clouds. Sound editor Rich Bologna does superb work with the sound in creating some unique textures for some of the exteriors that play into the air of silence as well as these quiet moments that add to the dramatic suspense. The film’s music by Heather McIntosh is wonderful as it’s mainly an ambient score that play into the sense of isolation and uncertainty while music supervisor Laura Katz provides a soundtrack that mainly feature bits of religious music as well as some early 20th Century jazz. The casting by Kerry Barden, Allison Estrin, and Paul Schnee is great as it mainly feature its three principle actors with Chris Pine in an incredible performance as Caleb as a drifter who arrives during the film’s second act as he would formally appear as someone that had seen the outside world as he finds himself attracted to Ann while being aware of John’s suspicions. Chiwetel Ejiofor is remarkable as John Loomis as an engineer who is dismissive towards ideas of religion yet he tries not to say much about it to Ann as he is a man of science where he tries to help her fix things as he also copes with his own sense of loss and longing. Finally, there’s Margot Robbie in a phenomenal performance as Ann Burden as a young woman trying to rebuild her family farm to sustain herself with the things she needs as she finds herself tempted by the presence of two men who have feelings for her knowing that she needs them to help her out. 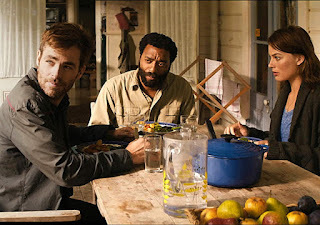 Z for Zachariah is a marvelous film from Craig Zobel with top-notch performances from Margot Robbie, Chiwetel Ejiofor, and Chris Pine. Along with its minimalist script, gorgeous visuals, and themes on survival and isolation, it’s a film that explore a trio of people dealing with the aftermath of a nuclear holocaust and see if they can live with one another without any problems. In the end, Z for Zachariah is a remarkable film from Craig Zobel. You liked this so much more than I did. I felt like Pine's character was so unnecessary. Great performances like you said, though. Glad you enjoyed this film. It deserves a lot more love than it gets. The three leads were all fantastic, too.